New drink package from September 2015: free choice of wine and more drinks! We are responding to your request to enrich drink package and from September 5th we are offering a new drink option including free wine selection and more drinks. Newly we offer 4 drinks – 1 soft drink, 1 wine of choice – glass 0,15 l, 1 cup of coffee or tea and any 1 drink of your choice (beer, wine of choice – glass 0,15 l, soft drink, or Bohemia Sekt Brut Chardonnay 0,15 l). Comparing to the drink list it represents up to 40% discount. We believe that this offer will satisfy you and enhance the overall Mozart Dinner experience. From 11th, April we are presenting new menu! It was compiled by famous chef Lukáš Vokrouhlík who already for the second time will represent Czech Republic at the Expo – The Universal Exhibition on industry and culture. Recipes are again Czech-Austrian and were chosen to provide great artistic experience in addition to gastronomic experience. What is there to look forward to? As a starter you can try pea soup with buttered croutons, main meal are very popular beef cheeks in red wine and thyme, served with celery and potato puree and in the end you will be served traditional Czech-Austrian dessert – homemade apple strudel. We are excited to share good news, Mozart Dinner has been awarded a renowned TripAdvisor award – Certificate of Excellence. This prestigious award recognizes those businesses that consistently earn top ratings from TripAdvisor travelers. Thank you for the trust you gave us, we appreciate it very much! maybe you are in love; maybe you want to propose to your partner or just to celebrate Valentine’s Day at a beautiful location in the center of Prague. Valentine’s Dinner with Mozart is the right choice for you! Enjoy romantic candlelight dinner and listening to the best of Mozart, including a three-course dinner inspired by recipes from Mozart’s time. We look forward to host you and we are happy to meet any special requests; just contact us to info@mozartdinnner.cz. 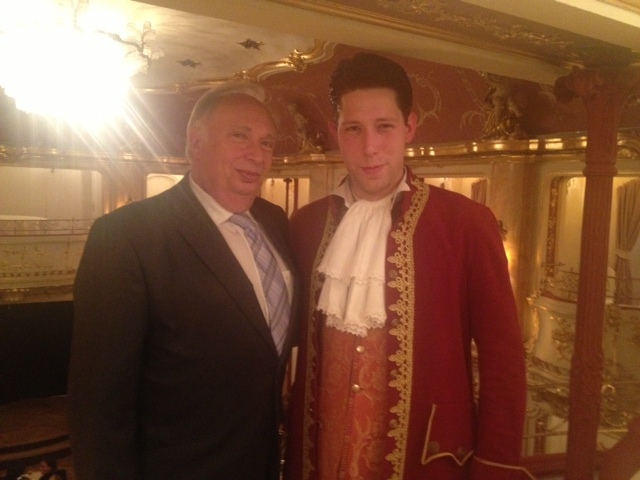 Prof. Ivan Klánský, world famous Czech pianist, music professor and laureate of many international competitions visited Mozart Dinner, this time in the role of a father listening to his son, baritone, Daniel Klánský. Traditionally we prepared Easter Mozart Dinner even this year. You can choose from Easter Saturday or Easter Monday to celebrate this spring holiday at the historically protected ballroom in the center of Prague and enjoy this special day at the wonderful performance by Terezie Švarcova a Daniel Klánsky. New prices in drink menu and new ticket categories including drinks! We listened to your feedback and introduced changes in drink prices. We reduced cost of some of the wines and extended our offer with various whisky and cognac. You also have an option to choose new ticket category that includes drink package in the amount of 210 CZK with 1 glass of local wine, 1 cup of tea or a coffee and 1 soft drink. We believe that those changes will increase your satisfaction. New program with the Queen of the Night! we prepared a new program that contains another famous arias and duets including one of the most difficult aria for soprano “Queen of the Night” from „The Magic Flute“. The excellent Terezie Švarcová will be singing it for you. We also extended the program length to enrich also the scenic experience. The first part consist of arias and duets from opera Don Giovanni, in the second party you will hear the best of Mozart operas and in the third one arias and duets from The Magic Flute opera. And our excellent string quintet will play The Little Night Music and some movements from Divertimento D-Dur. When the new program was first played on 9th Sep, the audience applauded standing ovation, 2 additions and would not let our musicians leave the stage. We hope that you will experience same atmosphere. Christmas Dinner Concerts in December and New Year’s Eve Opera! in December we are preparing for you advent concerts with Christmas atmosphere in decorated Boccaccio Hall and concert program enriched by Christmas carols. In addition to Mozart operas, our opera singers Daniel Klánský and Terezie Švarcová will sing the most beautiful Christmas carols at the end of the program. A special New Year’s Eve Opera programm will be performed at the dinner concert on 29th and 30th December 2013 with Johan Strauss waltzes in the last concert part and our singers will toast to a Happy New Year. Come and enjoy Prague in its traditional Christmas atmosphere! Dear audience, for Easter concert we prepared a special Easter menu consisting of traditional Czech recipes like nettle stuffing or rhubarb crumble pie. The entire menu can be found here. Come to celebrate this spring festival in the historic Boccaccio hall accompanied by Mozart arias and duets performed by outstanding opera singers Terezie Švarcová and Daniel Klánský.